On Monday 30th November 2 RGR, along with the whole of 16 Air Assault Brigade, will be replacing their Eagle flash with the historic Pegasus emblem as they re-subordinate under Commander Field Army. The change comes after a 15-year-long battle by the Parachute Regiment to reinstate its famous wartime emblem after it was controversially axed in a defence shake-up in 1999 despite the decision being met by strong opposition from politicians and former officers who argued it was part of the Paras’ regimental history. Some soldiers even went to the extent of stitching the emblem, which was approved by Winston Churchill and seen by many as the trademark of Britain’s airborne rapid reaction force, inside their uniforms after it was replaced so they could still wear it. Army reforms now mean the brigade is returning to Army control after having previously fallen under tri-service Joint Helicopter Command – and senior officers, many with a background as paratroopers, have pressed to reclaim Pegasus. The Army Board’s ceremonial dress committee has now agreed the move and Brig Colin Weir, commander of 16 Air Assault Brigade, will issue paratroopers with the badge at a ceremony at Colchester’s Melville Barracks next month. The emblem of the airborne forces is Bellerophon mounted on the winged horse Pegasus. The first instance of an airborne warrior, his exploits are recounted in Greek Mythology where he is chiefly famous for slaying the fire-breathing monster Chimaera. Mounted on Pegasus, with spear in hand, Bellerophon rode into the air, swooped down upon the monster and destroyed it. This emblem was chosen by the British airborne forces by Lieutenant General Sir Frederick (“Boy”) Drowning GCVO,KBE,CB,DSO,DL when he was appointed to raise Airborne Forces in 1941. The emblem was designed in May 1942 by Major Edward Seago, to be worn on the arms of all airborne soldiers. Gurkhas first wore this emblem, with the addition of the title “India,” when serving as part of 153 and 154 (Gurkha) Parachute Battalions during World War 2. These battalions became part of 50 Indian Parachute Brigade under the command of 44 Indian Airborne Division (later 2 Indian Airborne Division). Gurkha airborne soldiers fought with distinction at the Battle of Sangshak in March 1944 and at the fall of Rangoon in 1945. Reformed in 1945 as 2nd and 3rd (Gurkha) Battalions, Indian Parachute Regiment they served as part of 77 Indian Parachute Brigade at the end of the war. Images from this period clearly show the emblem on the arms of Gurkha airborne soldiers. 5 Infantry Brigade, including 1st Battalion 7th DEO Gurkha Rifles, served during the Falklands Conflict in 1982. Two Parachute Battalions had originally been part of 5 Brigade but transferred to 3 Commando Brigade prior to deploying to the South Atlantic. Following the Falklands Conflict, 5 Brigade was redesignated 5 Airborne Brigade in 1983 and included a Gurkha Battalion in addition to the other airborne units. 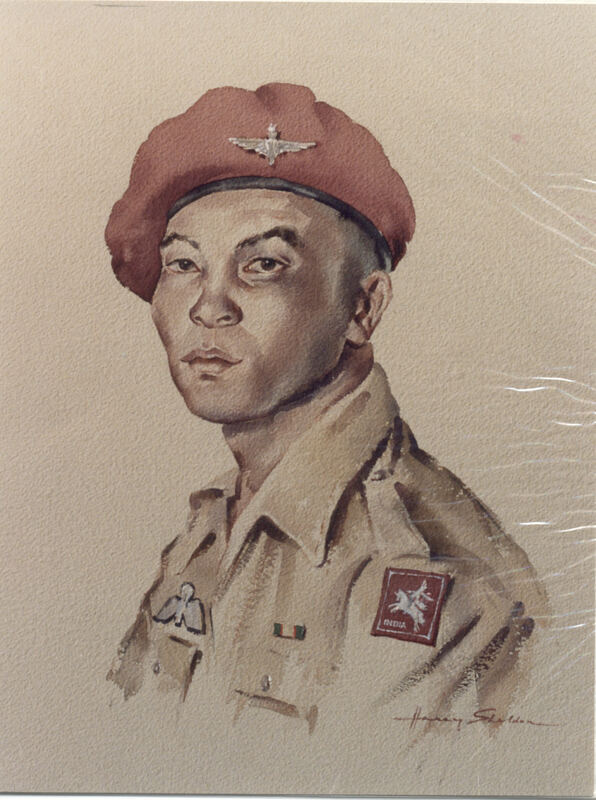 During this time the emblem was again worn by Gurkhas. At the end of 1996 an RGR Gurkha Reinforcement Company joined 2 Para and also became part of 5 Airborne Brigade wearing the winged Pegasus and Bellerophon. In 1999 the Brigade merged with 24 Air Mobile Brigade to become 16 Air Assault Brigade which had its own distinctive “striking eagle” emblem.